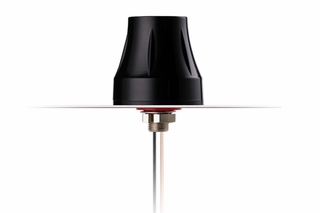 The Olympian MA140 is a high performance LTE and GPS/GLONASS screw mount antenna in a compact housing for external use on vehicles and outdoor assets. UV and vandal resistant ABS housing and thread. The Olympian MA140 is a high performance combination LTE and GPS/GLONASS screw mount antenna in a compact housing, for external use on vehicles and outdoor assets worldwide. The LTE antenna functions equally well on 2G and 3G. The GPS/Glonass antenna has stable gain and radiation patterns on both bands. Durable UV resistant IP67 ABS housing is resistant to vandalism and direct attack. A rubber O-ring is provided under the antenna to prevent water entering under the antenna. If the lower frequency bands are required the antenna functions best when mounted on a metal ground-plane, but can still work well with short cable lengths below 1 metres on plastic structures and is locked from the inside of the structure by a nut. The thread is extra small, allowing for installation in the tightest of environments.